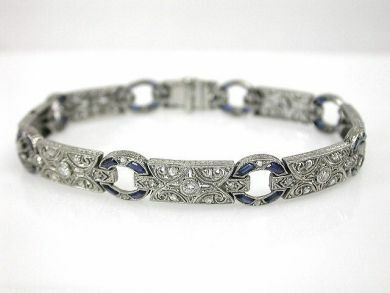 One platinum and 18 karat white gold art deco bracelet. Six old European cut diamonds (0.32 carats: VS1 clarity: G-H colour). Sixty-four rose cut diamonds (0.38 carats: SI clarity: H-I colour). Thirty-two synthetic blue sapphires (2.23 carats). The bracelet is seven inches in length.